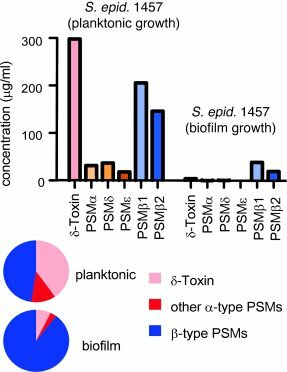 PSM production under biofilm and planktonic modes of growth. PSM production under planktonic (shaken 125 ml flasks containing 50 ml TSB/0.5% glucose, 18 hour growth, 37°C) or biofilm (24 hour static culture in microtiter plates, 37°C) modes of growth was assayed by RP-HPLC/ESI-MS. PSMs were determined in supernatants of planktonic or biofilm cultures after centrifugation. Absolute amounts are shown at the top, relative composition at the bottom. S. epid. 1457, S. epidermidis 1457.